Wavy plaid is not a new staff anymore but definitely an enduring trend for your home decor. Likewise, decorating your bathroom with this Park B. Smith wavy plaid shower curtain is an easy option that can brighten up the bathroom while making the narrow space look more spacious and attractive. If you feel the same way, grab it now and don’t let it slip away again! Among the “Watershed” Collection of Park B. Smith shower curtains, this unique one has the brighter colors that can bring in the summer feel to your room by accenting a white background. Also, as one of dutiful curtain, it has what it takes to be your great helper. To be specific, it is good at repelling water spray, resisting mildew, and protecting your family from allergy attack. What’s more, it adopts the 100-Percent Polyester fabric and metal grommets to ensure its high quality. So, you don’t need to change it in the years to come. One of the best parts of this item is that adding a line is dispensable at all. But the liner is still a good idea if you really like it and don’t want to risk ruining it. 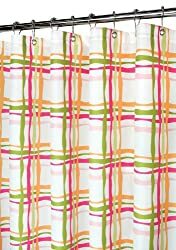 Another praiseworthy part of this Park B. Smith wavy plaid 72 x 72 watershed shower curtain is its vibrant and bright color. According to reviews from its buyers, the physical item looks much pretties than the pictures displayed online. More importantly, you can choose from as many as three color schemes – Tangelo, Pop Blueberry, and Black/Watercolor. It is highly recommended choosing the color based the style of your bathroom accessories. The above-mentioned are its pros. Of course, it has its part of cons as well. For example, its pattern is printed only on one side instead of on both two sides. And the fabric is a little bit thin so that it may blow in tub. However, apparently the manufacturer has noticed this problem and come up with a satisfactory solution – the weighted bottom. In short, this is a worthy addition to your newly redecorated bathroom.